As an example, we in the scientific computing community often need a graphical user interface (GUI) to allow the user to specify inputs for the simulation. However, it is often beneficial for the solver itself to be a standalone program. This allows us to run the actual computation in a batch mode or on supercomputers that typically are accessed via text-only remote shells. As such, the development often consists of two parallel efforts: development of the solver, and development of the GUI that exports the input files needed by the solver. To demonstrate this, below you will find an interactive code that implements the elliptic mesh generation method. This entire code (mesh.svg) is a text file only 13.9 kB in size. At present the mesh cannot be exported, however adding this functionality is trivial. The file size could be further optimized by reducing comments, etc… Again, make sure you are viewing this in a browser that supports SVG, this includes Chrome, Firefox, and IE9+. If you are reading this article through the email subscription, click here to open the article in your browser. If everything loaded fine, you should see a mesh similar to the one shown below. This type of a mesh is commonly used in Hall thruster analysis. You can click and drag any of the yellow circles in the demo above. 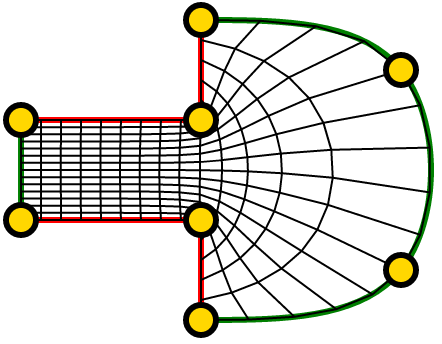 The red and green splines form the horizontal and vertical boundaries, respectively. The right vertical boundary is smooth, it uses the algorithm from the previous article on Bezier splines. Also note that the splines get split such that there is always a grid line passing through a control point. You can see this by for instance making the bottom boundary straight and moving the central point along the path. I am quite proud of this feature, it took a while to get working right :). Figure 1. Static screen shot of the interactive mesh you should see above if everything loaded fine. This type of a mesh is commonly used in Hall thruster analysis. Stay tuned, the math behind this code will be explained in a follow up article.